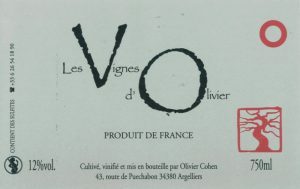 Olivier Cohen is a young winemaker from the Languedoc in the area behind Montpellier called the Hérault. 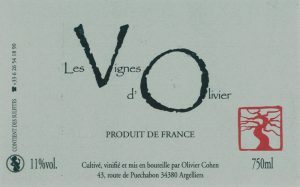 His domaine is called Les Vignes d’Olivier and he makes an absolutely stunning rosé wine as well as a number of interesting red wines. We were first alerted to this winemaker by the peripatetic Alex Foillard son of the famous natural winemaker Jean Foillard. Olivier used to sell wine rather than make wine. He worked in Nice at the well-known natural wine bar La Part des Anges as well as nearby Vinivore. It was at these venues that he developed his passion for natural wine and he became determined to learn how to make his own. He travelled to Corsica to work with stellar winemaker Antoine Arena. This was followed by stints at Domaine Valette (a leading winemaker in the Maçon), Frederick Rivaton in Roussillon and finally with the legendary Thierry Allemand in Cornas. He finally started work in his own vineyard in 2013 in the Languedoc where he has several really interesting plots spread over different terroirs with different aspects. His rose is the wine that initially turned heads in France and New York, but now his red wines are also gaining respect throughout the natural wine world. This is an absolutely stunning biodynamic rosé made from Cinsault grapes grown in his 5 hectares of vineyards at Argelliers not too far inland from the Languedoc city of Montpellier. 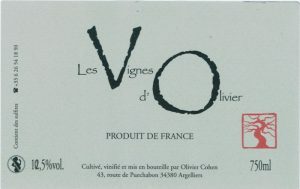 We were delighted when we first tasted Olivier’s wines in Montpellier at a natural wine show in late January. The rosé was absolutely stunning and we immediately asked if we could import his wines to Australia. He makes this wine purely by direct pressing the Cinsault. As with all of his wines this one has no sulphur added at any time. This very light rosé arose because Olivier’s wife happens to like white wines but Olivier doesn’t have any white grapes! He decided to make a white wine from some of his red Cinsault grapes – a very sensible idea giving that most red grapes have white juice. So he loaded part of his Cinsault harvest into the press and pressed off the juice. Unfortunately for his wife, but fortunately for everyone else, he pressed a bit too slowly so the juice came out as a lovely pale pink colour, so he produced a second rosé. He decided to called it Rosé Clair because it is almost clear. It is a light, lively, fresh wine with the texture of a white wine but the flavour of a rosé. The Rond Rouge is the first red wine from Olivier that we have brought into Australia. It is made from Syrah, Cinsault and Grenache from his vineyards in the Hérault. Here the grapes benefit from the careful vineyard work he carries out using biodynamic practices. This is a lovely, lively wine with soft tannins and a great mouthfeel. It is perfect for dishes such as braised lamb or a beetroot salad.